The name is a bit of a mouthful, but it does have the virtue of conveying most of what you need to know about this sophisticated retreat on Turkey’s Torba Bay. Casa Dell’Arte is just that: a house, or rather a villa, filled with a fabulous collection of original artwork from Turkish masterpieces to Fabergé eggs and even a Botero. It feels like the lavish vacation home of cultivated world travelers, and in a sense, that’s exactly what it is. Owners Fatoş and Yunus Büyükkuşoğlu have been traveling the globe for over thirty years, aquiring artworks at auctions and private studios; the Casa Dell’Arte Hotel of Arts & Leisure, perched on the bay outside Bodrum, is as much their exhibition space as it is a fashionable boutique hotel. Not to say that you’ll be sleeping in a museum. The collection is thoughtfully displayed throughout sleek rooms and outdoor terraces that double as lounge space, all facing out toward the water and a private jetty dotted with white chaise lounges and umbrellas. 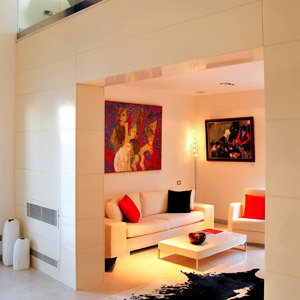 Inside, the Casa Dell’Arte contains just twelve suites, designed following a zodiac theme; each contains original artworks and unique decorative objects in addition to standard features like minimalist white sofas, spacious marble bathrooms, and linens and towels made from soft Turkish cotton. 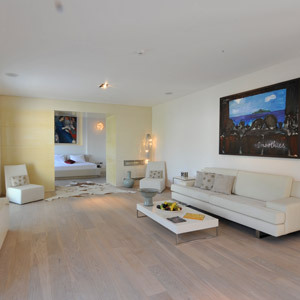 The airy Seaview suites, with their private terraces looking over the bay, are particularly striking, with huge modern paintings, sculptural lighting fixtures and pale wooden floors that, stretching as they do toward the blue water on the horizon, recreate the feeling of a sandy beach. 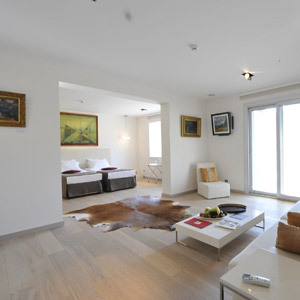 And with two levels and a plethora of shining glass, the super-sleek Duplex suites look and feel like mini art galleries. Outside, the “Silent Pool” is exactly what it sounds like, while the private jetty is a magnet for sunbathers. But you don’t have to wake up early to secure a chaise longue — only a handful of guests occupy the Casa Dell’Arte at any given time. All the more reason to luxuriate over a savory Turkish breakfast — fresh breads, cheese, tomatoes, olives, and, of course, strong Turkish coffee — at a canopy-shaded table at the hotel’s down-to-earth restaurant.